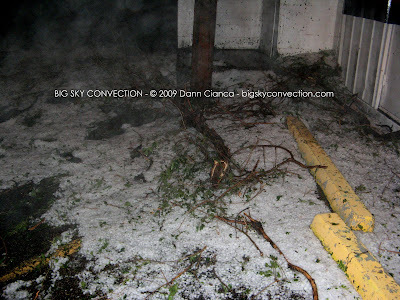 ALWAYS CHASING / BIG SKY CONVECTION BLOG: 2009 Storm Chase XXXI Report - July 20th - Crazy Severe Weather In Denver! 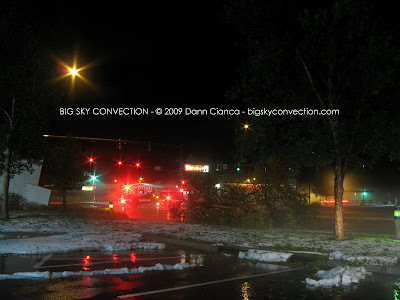 2009 Storm Chase XXXI Report - July 20th - Crazy Severe Weather In Denver! After going through the usual "If I left now ..." calculations, I realized it was hopeless. Even worse, none of my Colorado chasing buddies were on the storm. So, I watched things for a while and as the storms out east began to wane, my attention did as well. A few outflow boundaries rolled through the metro and I assumed one or the other was the expected cold front. I was wrong, however. I was actually beginning the motions of getting ready for bed when I thought to check the radar again. 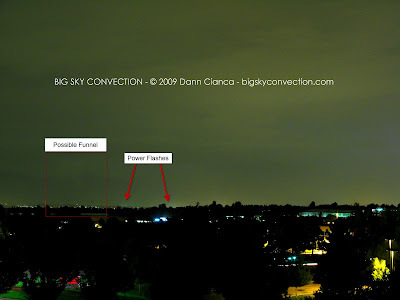 It was close to 9:30PM at this point and I was very surprised to see cells firing all over the north side of the Metro. I activated the lightning net and decided to walk up the street to see if I could shoot some lightning. There were a couple cells going up to the southeast and there is a lot by my new apartment which yields good views to that direction, so I walked there. Unfortunately, those cells quickly died and I focused my attention on those on the north side which were acquiring a lot of strength. 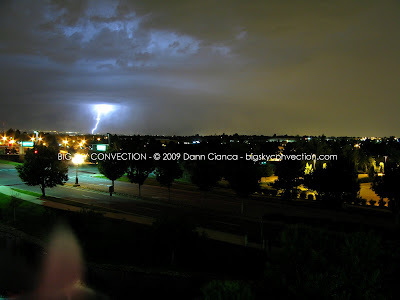 I walked up to East Caley Avenue and South Syracuse Way where I stood atop a parking garage which had a good view to the northwest and began to shoot lightning. I was pleased with this new found perch as aside from having a great view, there is also nice fountain in the foreground. I ended up taking quite a few shots as the storms strengthened and moved south-southeast along the Footies. Finally, I started to get some cloud-to-ground strikes, though they were distant. As the storm approached, I began to see green flashes along the leading edge. My first thought was power flashes but upon checking my phone, the storm was only severe warned. I dismissed these flashes as lightning behind the precip core and continued photographing. Occasionally, I would see some interesting as we like to say, "hangy-downies" (I'm not taking credit for that one, I heard it elsewhere) but for the most part, it all looked like outflow structure. I eventually realized that this storm was quite the best. 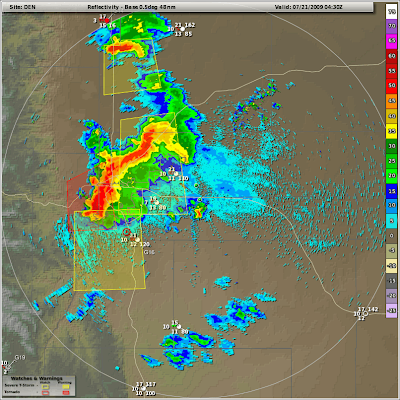 Storm structure became apparent and I was able to see some shelving and striations over the FFD precip core. Also, to its left I began to see a wall cloud. I realized at this point that the storm had become tornado-warned. In my head, I realized that one couldn't chase a tornado-warned storm on foot! ... check out the wall cloud on the photos below! Time was of the essence as I made the decision to get in the car and head south, to either get ahead of or core the storm. So, I was soon on the road. Traveling south on I-25, the meso looked amazing. I wish I could have come out of the light precip enough to set up a nice shot ... the wall cloud was lit up very well by the city lights as well. I got off the highway at Lincoln and headed west, but found myself lost in trees and hills and without a good view. I returned to I-25 and stopped again at the Happy Canyon exit where I filmed some "interesting structure" coming up from the north-northwest. The precip quickly caught me again and I continued south to Castle Rock where I set up in the parking lot of the outlets and tried to shoot some lightning/structure photos. Unfortunately, the outflow was quickly upon me and the wind in addition to the rain made shooting lightning very difficult. My tripod was all over the place and droplets of water blurred the lens. I did manage to get one CG before the deluge began, though the foreground is awful. At this point, I realized the storm was outflow in nature and decided to core it and get on the backside for some lightning shots. As I got on the highway, I spoke with Tony Laubach who was in the midst of heavy damage in the Wheat Ridge area. I decided to head up there and check things out. I spoke with Scott Hammel as well and he decided to meet me up there. However, I had to get through the core first! As I left Castle Rock, the visibility went to zero. The rain and wind were driving right into me and I could hardly see a thing! I continued on while all the traffic pulled over to the side of the road. There was a little hail mixed in but it wasn't large. As a reminder of the poor conditions of my tires, I was hydroplaning like a boat ... it was a bit hairy at times. Eventually, as I descended down into the metro area, I came out of the precip and continued north to 6th Avenue where I headed west to Kipling. Right after the Wadsworth exit, I found massive hail drifts on the side of the highway accompanies by some serious hail fog. I pulled over to grab some quick video and took in a deep breath of the hail shred. The aroma was very intense. I got off the freeway (6th) at Kipling and turned north. The streets were covered with hail and foliage and the power was out. It didn't help that the hail fog was very thick as well. I continued slowly north noting some minor tree damage ... a few big branches down here and there. As I approached 13th, a fire truck straddled the road in front of me. I turned off into residential streets and ended up in a bowling alley parking lot just west of Kipling on Colfax. There, I talked to few witnesses who endured the storm. Most reported crazy wind and hail with a few mentioning a funnel cloud. By the time the conversation was over, they had all begun saying that they had seen a tornado ... which I thought was interesting. Funny how their stories changed after talking to one another. "Oh yeah, I saw that too!" I sifted through the hail looking for the larger stones. Though the amount was high, most stones were smaller than 1.25". Scott finally made it through the closed streets and was in the 1st Bank building parking lot to my northwest, so I joined him over there. 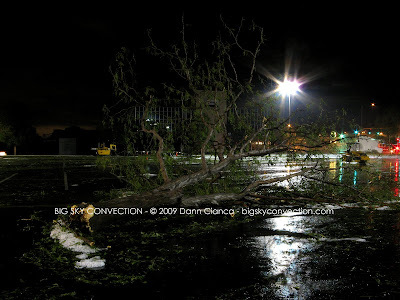 We found a tree that had been toppled and another that had been moved into the middle of the lot! Eventually we found a hole in the ground where the latter had come from, but for a good while, we were searching! I noted that most of the leaves were stuck to the north side of the buildings and other objects. The tree that had been uprooted came from the northeast corner of that building. The grass on in the landscaping was all laid down from north to south; the damage was all rather uniform. We stayed out and surveyed damage for another hour or so. I bisected the damage swath a couple of times and found that all the broken trees had fallen in the same direction. ... and there were plenty of those ... on vehicles, power lines, etc. The place was a mess. 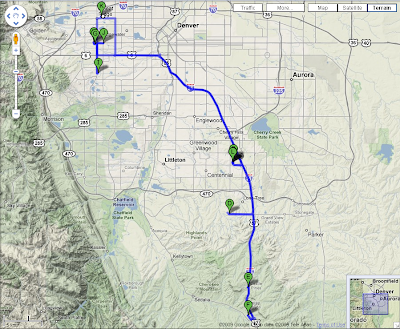 I went as far south as Alameda and as far north as 38th. The hail was common inside the swath and although there were reports of a tornado in the vicinity, I could find no evidence to support that. The only anomaly to the damage pattern was a window broken on the north side of a building on Colfax. However, most of the glass was on the outside of the window. Eventually, I gave in to my horrible headache and my wake-up time of 6AM and headed on home. I arrived just past 2AM to find that I had left the north facing windows of my apartment open. Needless to say, I had to set up a fan do dry the carpet before I could get some shut eye. 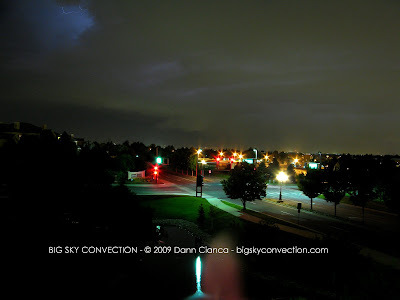 I was in Castle Rock at the time and the storm was WELL past Englewood. I noticed that the local WFO took the report out of their LSR today, so it may have been bogus. 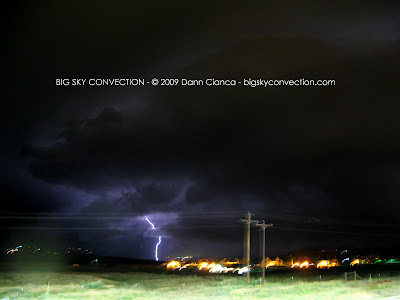 ... which happened after I left Castle Rock and cored the storm. So, maybe it wasn't outflow-dominant at the time as I thought. 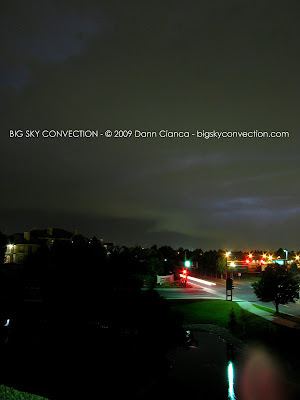 With that said, there was tons of low cloud structure with this storm an it's entirely possible this was scud. It is hard to say for me as I didn't see the report in question. My attention at the time was turned to the north anyway. So ... going back to the power flashes, I think they were on the leading edge of the massive RFD hail downburst that swept through the west side of the metro. Given that it was night, it's impossible to rule out a tornado, I just can't find evidence (other than reports of a funnel cloud) to support it. 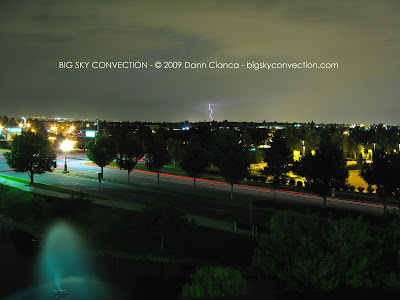 I've analyzed some of my lightning photos from the time and was able to see some power flashes along the ground as well as some possible funnel clouds (again, very hard to say as I was quite far away ... I'm just trying to substantiate the reports of a funnel in the area at the time). You'll want to click the image for a much larger version. So wow! What a fun night ... the whole city is talking about the storm today and the damage was actually quite incredible. Thanks to the cold front which actually came in later than I thought, the lapse rates went through the roof and though the winds were out of the north before the front, as it passed, we achieved a slight easterly component aiding the general upslope and we really saw the topographical forcing along the Footies where we had been capped all day. Major tree damage, moderate structural damage, some flooding, hail fog, wall clouds, etc. Man that picture with the possible funnel looks mighty suspicious. 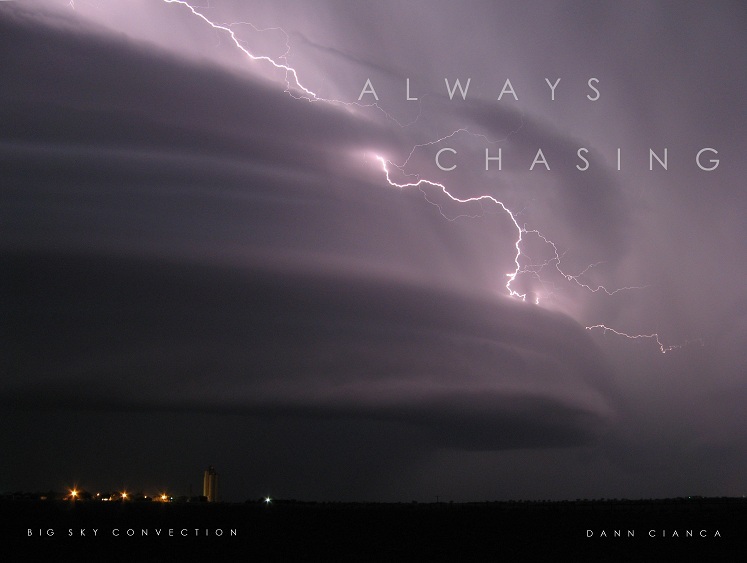 Great read Dann, and great job on the photos. "took in a deep breath of the hail shred. The aroma was very intense." Nothing quite like freshly mowed everything! What a year to be in Denver, wow. Last night was insane! Everyone at work tonight was like, "let me guess? You were in Wheat Ridge?" Hahaha...Nice shot of the wall cloud too by the way. One day I will learn how to take night time photo's. Definitely glad we decided to check out the damage! Great report Dann. Thanks for including the radar grabs. That storm blew up faster than a lot of storms I've seen this year. Glad to see you got some CGs. Great report and photos, wondering if those power flashes were result of a tornado. 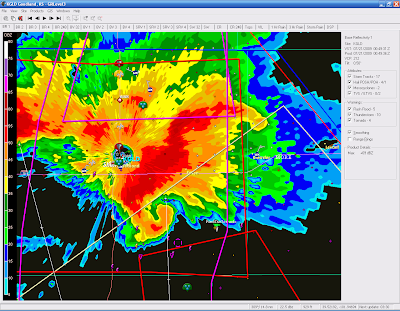 However don't forget one of us was out there in Kansas, I was on that storm and had a dramatic tornado experience. Michael: It definitely does ... but there was a TON of scud on that thing, so I'm not going to say anything for sure. Scott: You just got'a practice man ... my early stuff was awful ... I'm still learning.